Jim Abbott turns 47 years old today. One of the most inspirational athletes of my generation, Jim Abbott and his amazing story remain as a precious baseball memory for me. 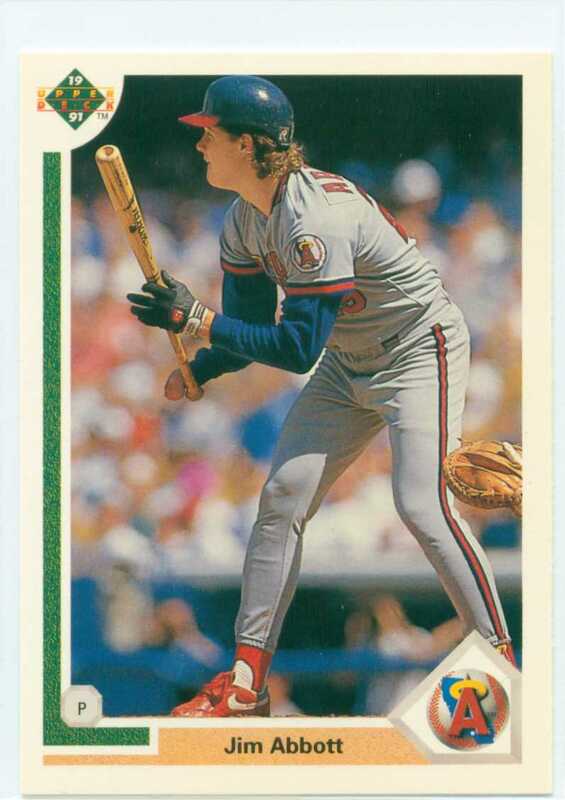 I knew little about Abbott prior to his rookie card debut in the 1988 Topps baseball card set. Back then it meant quite a bit to be part of the Team USA set so I always tried to spend a little time learning about the players featured. And with no Internet, this was quite a challenge. But when Abbott’s second card came out in the 1989 Topps set, he had a reputation and stories about him and his abilities became more available to collectors. Abbott was a fan favorite in each city he called ‘home’. And on the road he was quite an attraction. 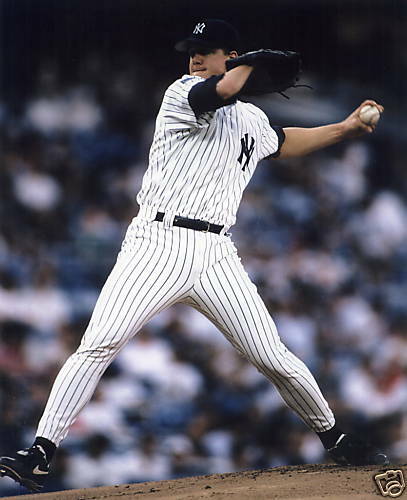 1993 HEADLINE – Jim Abbott Hurls No-Hitter For Yankees!! On this day in 1993, Jim Abbott pitched a no-hitter for the New York Yankees. All major league starting pitchers have the talent to throw a no-hitter. Yet of all of the guys that I have seen, watched, or read about tossing a ‘No-No’, Jim Abbott’s performance back in 1993 was astonishing to me and remains a bold memory for me 17 years later. While putting in 9 innings of work, Abbott threw 119 pitches. And while walking 5 batters and striking out just 3 men through the game, it was Abbott’s competitive nature that helped him through the game which led his team to victory and him into baseball’s record books!!! 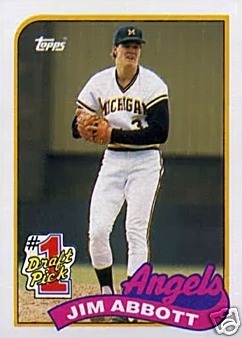 1989 HEADLINE: Jim Abbott Makes Major League Debut!!! 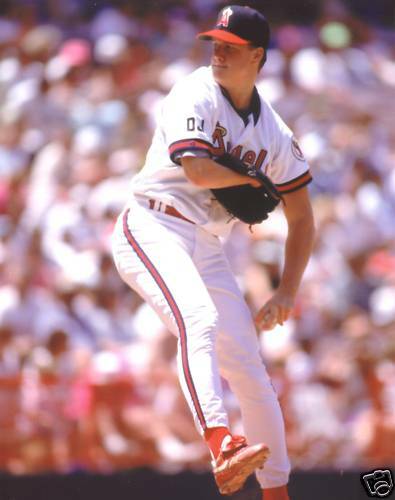 On this day in 1989 Jim Abbott made his major league debut with the California Angels. Prior to this day, Abbott had already conquered Little League, High School baseball, Collegiate Baseball, and even The Olympics. Yet this day stands alone. On this day he stood toe to toe with the best baseball players in the world and was their peer. Disability or not, he made it to the major leagues defying odds and hurdling obstacle after obstacle that was thrown his way. On the day, and in front of more than 46,000 fans in attendance, Abbott got hit pretty hard by the Mariners. Going just 4 2/3 innings, he allowed 6 hits and 6 runs. He took a loss and the team lost the game 7-0. Mr. Jim Abbott – A true baseball hero and icon!!!! Jim Abbott turns 46 years old today. Sure, there may be better looking card designs (even though UD reigned supreme in the early 1990’s). But the image captured on this card is what makes it earn the top spot in my ‘Fab Five’ list. As a kid when I pulled this card from a pack of cards, I was mesmerized. Yes, I knew Abbott’s story, but I never fathomed that he could hit the ball. I would put this card up against any card issued in the 1990’s as the most memorable card from the decade – here I stand (sitting) in 2012 and I still vividly recall the awe I had as a 16-year old kid when I first saw this card. As a major leaguer, Abbott had 24 official at-bats. He collected two hits and 3 RBI. His professional batting average is .095.